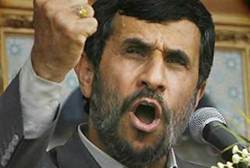 Iranian President Mahmoud Ahmadinejad has called on 'like minded nations' to join him in forging the New World Order. Iranian President Mahmoud Ahmadinejad on Thursday said that Iran and like-minded nations needed to "define the New World Order system." Ahmadinejad made his remarks at the inauguration ceremony of the International Conference on 'Hollywoodism and Cinema' in Tehran on Thursday. "Nations loving justice and affection should define the new world system," he said. During his speech, Ahmadinejad underlined the necessity for the start of a New World Order, and said the "justice-seeking nations should cooperate with each other to materialize this goal." Tehran has campaigned to forge alliances not only with the modern plutocrat-dominated Russia, but Fidel Castro's Cuba, and Hugo Chavez in Venezuela. The 2nd international conference on 'Hollywoodism and Cinema' is widely regarded as a propaganda platform for the Islamic Republic to attack Western culture and perpetuate its regime. The conference is being held as a sideline program of the 2012 Fajr International Film Festival.